The Colorado Trust launched its Early Childhood Council Health Integration grant strategy in 2008. 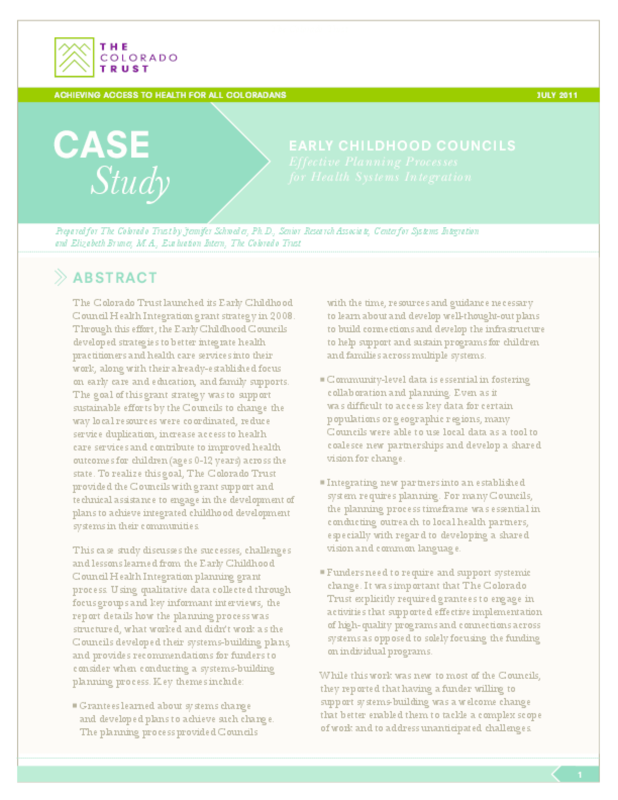 Through this effort, the Early Childhood Councils developed strategies to better integrate health practitioners and health care services into their work, along with their already-established focus on early care and education, and family supports. The goal of this grant strategy was to support sustainable efforts by the Councils to change the way local resources were coordinated, reduce service duplication, increase access to health care services and contribute to improved health outcomes for children (ages 0-12 years) across the state. To realize this goal, The Colorado Trust provided the Councils with grant support and technical assistance to engage in the development of plans to achieve integrated childhood development systems in their communities. Grantees learned about systems change and developed plans to achieve such change. The planning process provided Councils with the time, resources and guidance necessary to learn about and develop well-thought-out plans to build connections and develop the infrastructure to help support and sustain programs for children and families across multiple systems. Community-level data is essential in fostering collaboration and planning. Even as it was difficult to access key data for certain populations or geographic regions, many Councils were able to use local data as a tool to coalesce new partnerships and develop a shared vision for change. Integrating new partners into an established system requires planning. For many Councils, the planning process timeframe was essential in conducting outreach to local health partners, especially with regard to developing a shared vision and common language. Funders need to require and support systemic change. It was important that The Colorado Trust explicitly required grantees to engage in activities that supported effective implementation of high-quality programs and connections across systems as opposed to solely focusing the funding on individual programs. While this work was new to most of the Councils, they reported that having a funder willing to support systems-building was a welcome change that better enabled them to tackle a complex scope of work and to address unanticipated challenges.